Nutritionists and doctors agree that consuming soft drinks in excess is associated with several health complications and diseases, including weight gain or obesity, poor dental health, diabetes, cardiovascular disease and more. Some of these health conditions can play a role in increasing one’s risk of developing cancer. Soft drinks are carbonated because of the active ingredient CO2. When CO2 is forced at high pressures into water, the process of dissolving it creates the effervescent bubbles familiar to anyone who has consumed a soft drink or sparkling water. However, another byproduct of the CO2 dissolution is carbonic acid, which becomes much more acidic when combined with the flavoring agents of most sodas, potentially causing dental health problems. Currently, there is no evidence to suggest carbonation is associated with increased cancer risk, but it can be problematic for other health reasons. Certain symptoms associated with cancer and related treatments, like gas, bloating, heartburn or reflux, may be exacerbated by drinking large amounts of carbonated beverages, or even drinking any beverage through a straw,” says Stacy Kennedy, MPH, RD, CSO, LDN, senior clinical nutritionist at Dana-Farber. “If you find sparkling water or gingerale are helpful in mitigating nausea, but you are experiencing these carbonation-related symptoms, try to stir out the bubbles or let the beverage “go flat,” before consuming,” Kennedy recommends. Sugar naturally occurs in many healthy foods such as fruit. Your body needs sugar to create glucose, which is the primary energy source for the body. But most people consume way more sugar than their bodies need, often due to eating foods and beverages with added sugar, such as soda. 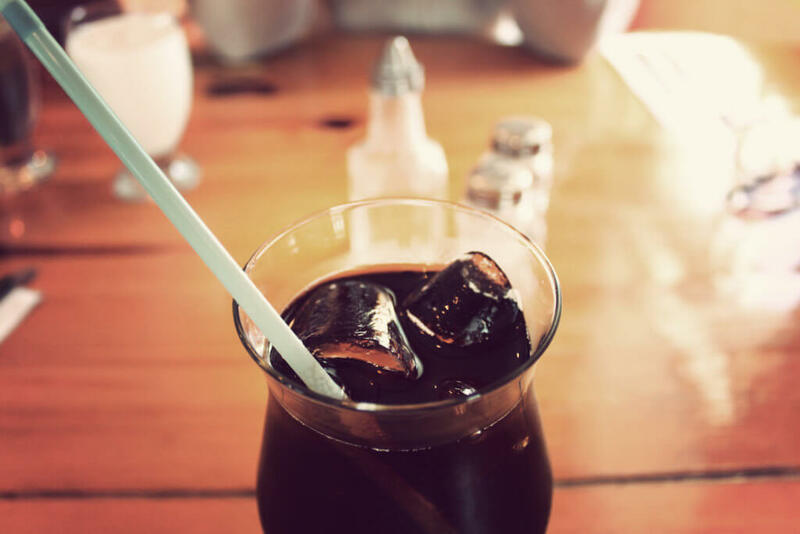 The sweetener in regular, full-calorie soda is often in the form of high fructose corn syrup, an added sugar based sweetener used in processed foods and soft drinks. One can of cola averages about 39 grams of sugar. The American Heart Association (AHA) recommends adult women consume less than 25 grams of added sugars per day, and for men, 36 grams per day. Therefore, consuming just one can of cola means you’ve exceeded your recommended daily allotment for added sugars. Consuming excess sugar takes a toll on the body. When sugar enters your bloodstream, your pancreas release insulin to convert the sugar to glucose for energy. Over time, and especially if overweight or obese, the cells in our body that use glucose can become resistant to insulin. While the reason for this resistance is largely unknown, the resulting effect is that there is too much sugar in the bloodstream—a condition called hyperglycemia. This puts the pancreas in overdrive as they produce insulin to no avail. If blood glucose levels remain higher or much higher than normal, you may develop pre-diabetes or type 2 diabetes. When sugar is not converted to glucose for energy, the body can’t use it, so instead, the liver metabolizes the excess sugar and creates triglycerides, which are then absorbed by fat cells. So, in essence, when we consume more sugar than our bodies need, it’s stored as fat. Insulin resistance and overconsumption of sugar both contribute to weight gain and obesity. Obesity’s underlying conditions, including excess fat cells, insulin resistance, and chronic inflammation, are thought to play a role in the development of cancer; in fact, obesity has been linked to thirteen different types of cancer. While soda’s deceivingly-branded alternative, diet soda, contains no calories or sugar, it does contain artificial sweeteners, including aspartame, one of the most common artificial sweeteners in use today that is about 200 times sweeter than regular sugar. Other artificial sweeteners include acesulfame potassium (ace-K), commonly found in “healthy” electrolyte drinks, as well as saccharin. While early research found that saccharin was linked to cancer in laboratory rats, no such cancer connection was found in humans, as evidenced in over 30 human trials. To date, the National Toxicology Program, the National Institutes of Health, and the Food and Drug Administration (FDA) conclude that saccharin is not considered a carcinogen. Studies have examined artificial sweeteners’ effect on the body, but they yield inconsistent results—some studies have seen artificially-sweetened beverages assist with weight loss and maintenance, while others have shown that artificial sweeteners can actually trigger sugar cravings, often resulting in weight gain. More recent studies are examining correlations between artificial sweeteners and insulin resistance, as well as type 2 diabetes, too. What’s more, some studies have shown that artificial sweeteners have the potential to alter gut bacteria, which can result in hyperglycemia. Artificial sweeteners have also been linked to diarrhea, which many cancer patients already experience as a common side effect of cancer treatment. Soda’s remaining additives are heavily regulated by the FDA. One such additive is 4-Mel, a chemical found in the most common artificial coloring (caramel coloring) in processed food and drinks. While once thought to be possibly carcinogenic, the FDA concludes that human exposure to this chemical is in quantities that are too small to result in any immediate or long-term health effects. Maintaining a healthy weight, or losing weight if you are overweight or obese, is recommended to help reduce your risk of cancer or its recurrence. Reducing your added sugar intake is one step you can take to keep a healthy weight and improve overall health. If you regularly consume soda, it is recommended that you cut back or eliminate it entirely from your diet. Check out these tips recommended by Dana-Farber nutritionists to help you maintain a healthy weight. Although there is no direct, proven relationship between soda consumption and cancer, it is important to be aware of potentially harmful habits related to the foods and drinks you regularly consume. Learn more about Nutrition Services at Dana-Farber Cancer Institute.